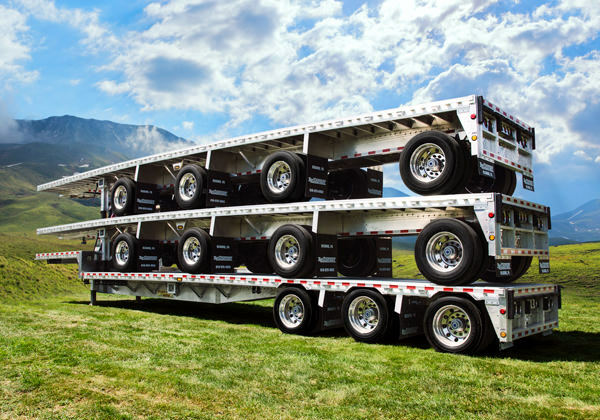 Whatever Your Hauling Requirement, There Is a Reitnouer Trailer for You. 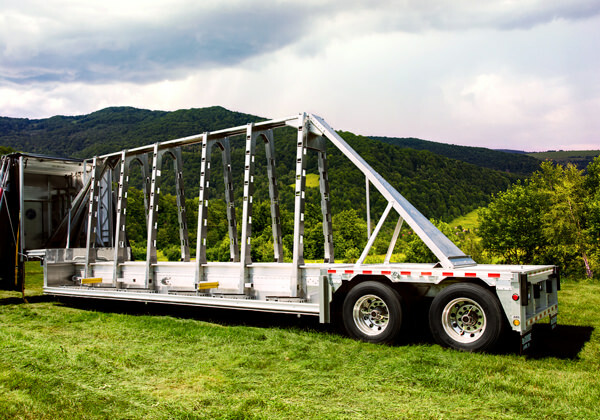 Every Reitnouer trailer is engineered for long life and easy maintenance, with a rock-solid design proven over millions and millions of miles. What makes a Reitnouer better? Advanced design and manufacturing. For example, with the exception of the rub rail, there’s not a welded aluminum joint anywhere on a Reitnouer. Why? Because research and experience show that when a heat-treated aluminum alloy is welded, the intense heat required to weld the joint significantly reduces the aluminum’s tensile strength at the point of attachment. 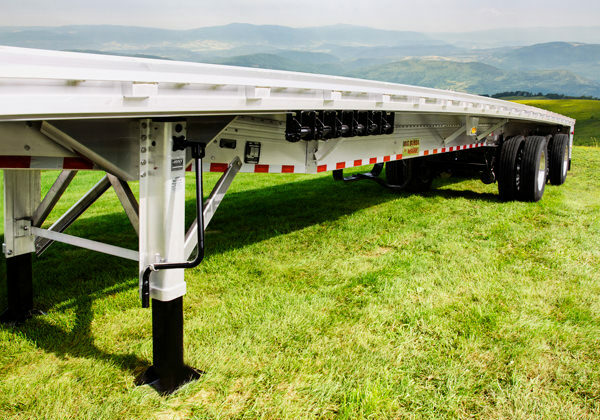 It is this innovative design and manufacturing approach that makes Reitnouer trailers stronger, more durable and more repair-friendly. A Reitnouer trailer also boasts many innovations that you’ll find only on a Reitnouer. 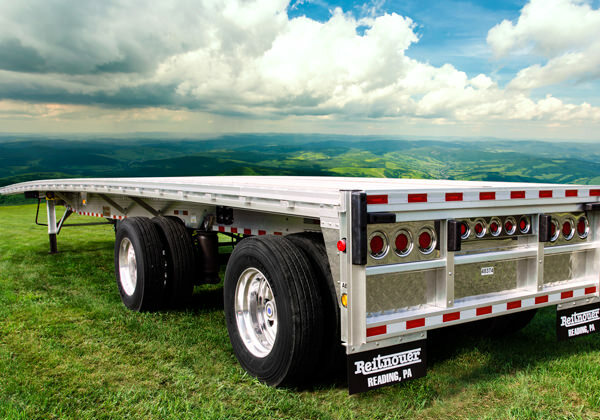 And Reitnouer trailers are continually evolving to meet your changing needs and the demands of a road well-traveled. But what really makes our trailers stand out is that every Reitnouer trailer is backed by an unwavering commitment to quality and customer service. It’s been that way since 1982. It’s not going to change. The flagship of the Reitnouer line is the Bigger Bubba. The Bigger Bubba has a GVWR* of 120,000 lbs. and is rated at 72,000 lbs. in a 4-foot section, 85,000 lbs. in 10 feet, and 110,000 lbs. over 48 feet — all of this at a weight of under 10,000 lbs. in a 48’x102” trailer. The Bigger Bubba is Reitnouer innovation, design and reliability in a hauling monster with the bigger bones to handle the most extreme cargo loads. And of course, Bigger Bubba models are available with the full range of Reitnouer features and options, as well as in drop-deck and multi-axle versions. Big Bubba flatbed models boast a GVWR of 100,000 lbs. and are rated at 70,000 lbs. in 10 feet and 60,000 lbs. in 4 feet — a legend that continues to set the standard for heavyweights. (Not bad for a trailer that weighs an average of 3,000 lbs. less than any steel trailer even approaching Big Bubba’s hauling capacity.) Big Bubba models are available with such options as an all-aluminum bulkhead, aluminum logging pockets, super single tires, aluminum tool boxes and many, many more, as well as in drop-deck and multi-axle versions. The MaxMiser flatbed has a 90,000 lb. GVWR capacity, rated at 60,000 lbs. in a 10-foot section, and a full 50,000 lbs. in a 4-foot section. The unique bolted design of the MaxMiser, combined with such innovative features as a solid one-piece crossmember reinforced with an inner extrusion that actually adds reinforcement between the main beams, and our sliding tie down system with four standard (and a fifth optional) tracks to make sure you can chain at any location, offers a unique combination of value, capacity, weight savings and longevity to your purchase. The MaxLite is Reitnouer’s lightest aluminum flatbed, designed for our weight-watching customers who want high strength but who don’t haul heavy, concentrated loads. lb. rating in a 10-foot section, and a 45,000 lb. rating in a 4-foot section — a good choice for evenly distributed loads. Like every Reitnouer trailer, MaxLite is available with a full range of Reitnouer features and options. The Bigger Bubba and Big Bubba are also available in Multi-Axle configurations, and Reitnouer offers B-Trains in a variety of styles. Your Authorized Reitnouer Dealer can answer your questions and help you spec a Reitnouer trailer that meets your multi-axel or B-Train needs. 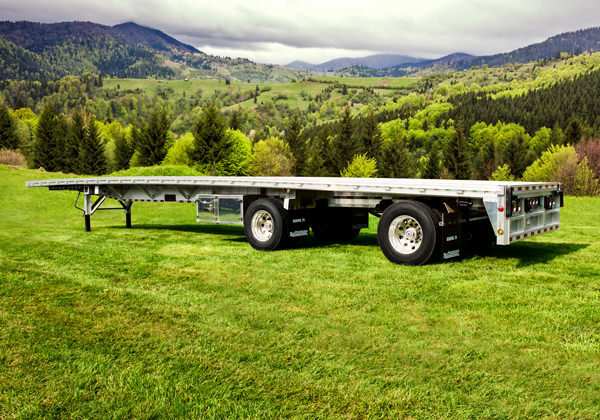 Reitnouer builds drop-deck models that offer the same hauling capacities as the MaxMiser, Big Bubba and Bigger Bubba flatbeds, with a rear deck height of only 40 inches. The Reitnouer DropMiser drop-deck delivers the strength you need with the increased load capacity of an aluminum trailer. The DropMiser utilizes a T-1 steel front gooseneck section bolted to an aluminum rear section that has eliminated the fatigue cracks common on aluminum front sections. An improved rear transition design eliminates the splice plate and improves the structural integrity of this crucial area of the main beams. 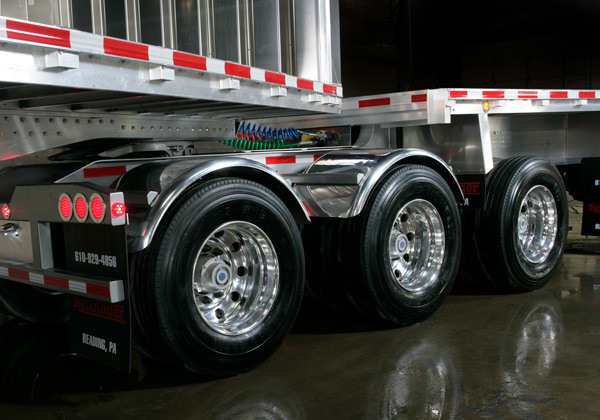 available in tandem, spreads or triple-axle configurations, and a two-position slider is available for those customers who need to travel through multiple jurisdictions where axle laws require different settings. Your Authorized Reitnouer Dealer can answer your questions and help you spec a Reitnouer drop-deck that meets your specifications and needs. 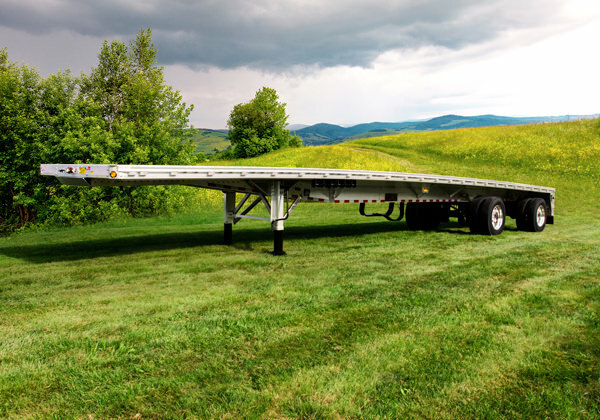 All Reitnouer multi-axle trailers are available in three-, four-, seven-, and eight-axle configurations, as well as tri-nine and quad-nine designs. All combinations are available with various assortments of lift axles and steerable axles and a wide range of Reitnouer options. Your Authorized Reitnouer Dealer can answer your questions and help you spec a Reitnouer drop-deck that meets your specifications and needs. If B-Trains are your tool of choice, Reitnouer has a combination that will work for you. 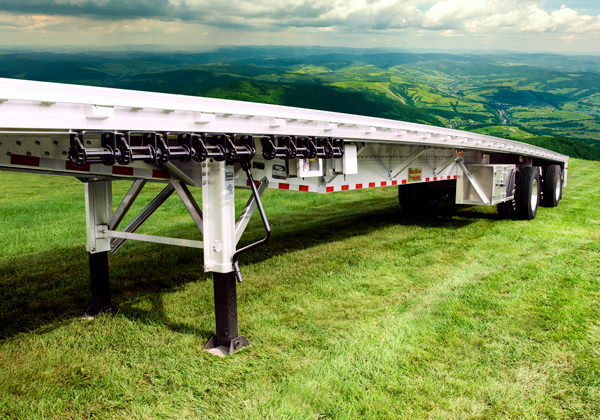 Reitnouer B-Trains are available in lengths from 28 ft. to 32 ft., widths of 96 inches or 102 inches, and with five-, six-, seven- or eight-axle designs. All combinations come with a T-1 steel designed stinger on the lead trailer — adding high-strength steel to only the area it is needed gives you the light weight and durability you are looking for. Lift axles, sliding axles, and steering axles are all readily available features as are a wide variety of Reitnouer options. Your Authorized Reitnouer Dealer can answer your questions and help you spec a Reitnouer B-Train that meets your needs. 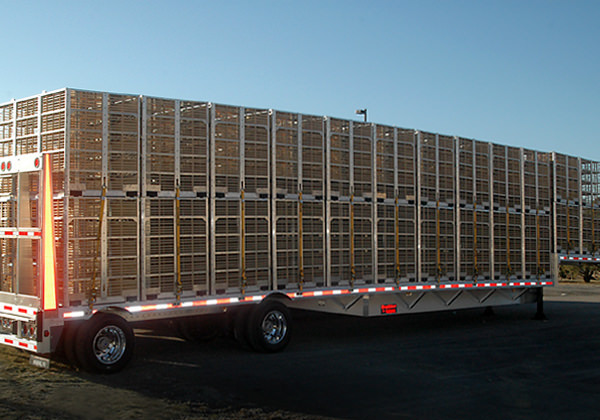 Reitnouer builds a wide variety of specialty trailers for very specific applications — glass trailers, poultry trailers and a whole lot more. 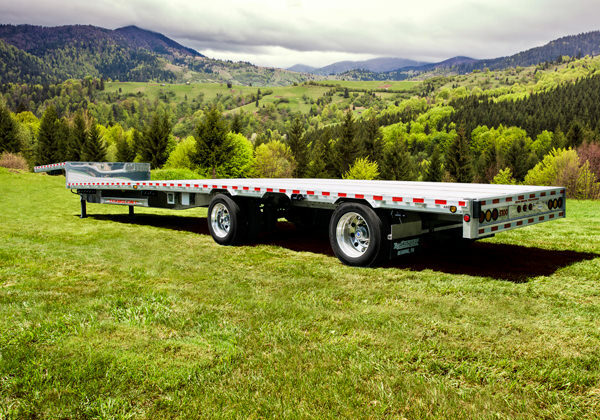 And every Reitnouer specialty trailer features the design innovation, craftsmanship, quality and reliability that has made Reitnouer the largest manufacturer of aluminum flatbed trailers in the U.S.
Our goal is to serve the needs of our customers. Your Authorized Reitnouer Dealer can answer your questions and help you spec a Reitnouer trailer that meets your specialized needs. Deck Dimensions: DropDeck Only—Front Deck–10’ 8”; Rear Deck–depends upon overall length; Drop–23”; Rear Height–40”; other lengths and King Pin settings available. Options: Most industry requested options are available. Our goal is to serve the needs of our customers. Every Reitnouer trailer is completely customizable with industry-standard and specialized options to meet your specific needs. Your Authorized Reitnouer Dealer can answer your questions and help you spec a Reitnouer trailer that meets your needs.